Lech-Zürs, Austria – After bad weather delayed our airport transfer in London, my friend Richard and I didn’t arrive at the Hotel Sandhof in Lech until 11 p.m. local time. Knowing that we would miss dinner, the hotel’s staff thoughtfully laid out a spread of cold cuts, cheese and bread for us to help sate our appetite 12 hours after we had enjoyed our last meal. The airline also left my skis in London for three days. 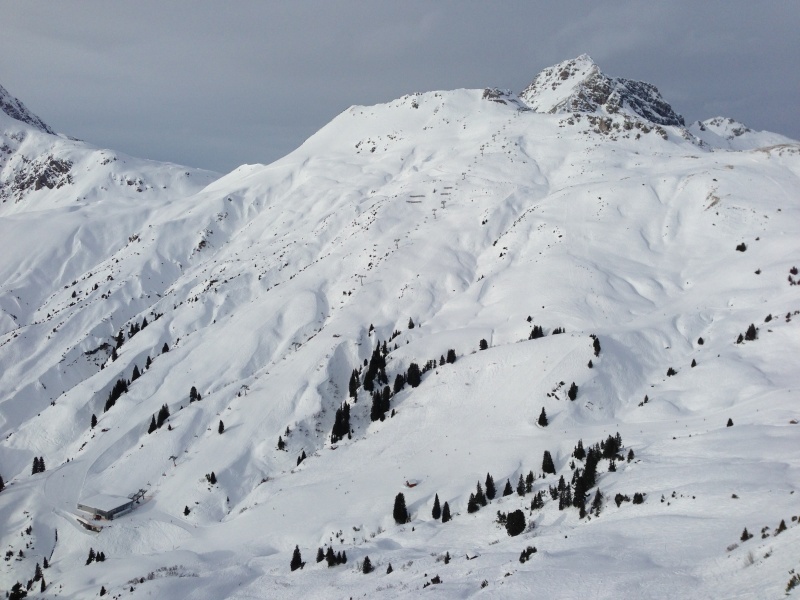 In was an inauspicious start to our visit to the Arlberg region of Austria in January 2013. Richard skis primarily on the groomers, and Lech has a better reputation for groomed runs than St. Anton. 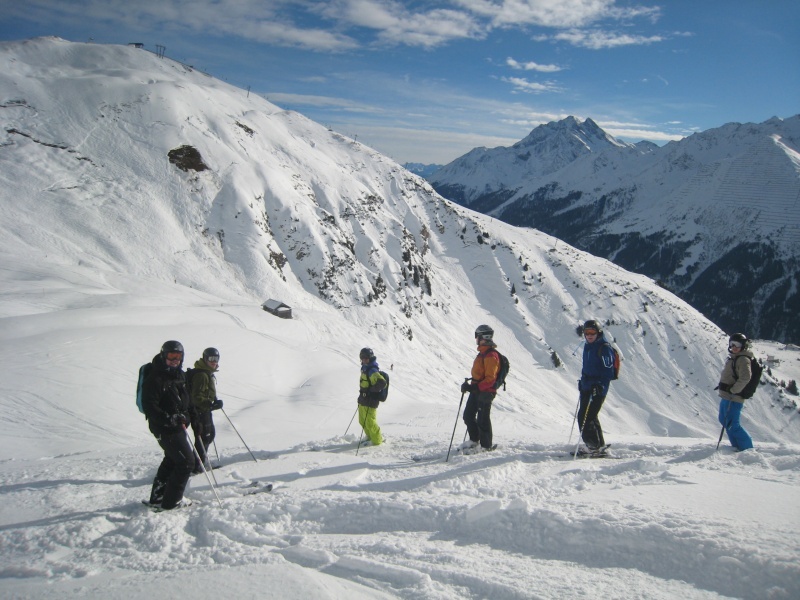 I, however, wanted to experience some more adventurous off-piste and (hopefully) powder skiing so I reserved three days of guided skiing for myself in St. Anton with Piste-to-Powder. 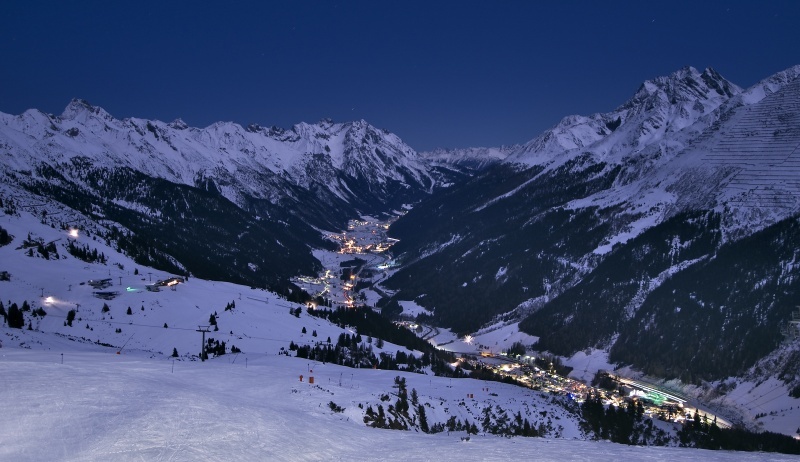 St. Anton may be home to the lion’s share of lodging in the region, but both Lech and Zürs are more intimate and upscale resort villages. We opted to base ourselves in Lech. Annual snowfall statistics were supplied by Fraser Wilkin of www.weathertoski.co.uk. Snowfall information from resorts in the Alps is often less useful than in North America due to the huge vertical scale of most resorts, and the fact that most measurements are taken at resort elevations. The Arlberg is an exception to that rule, with St. Anton’s snow being measured at the mid-mountain Galzig location. Lech’s snow is measured at the resort, and skier consensus is that Lech and Zürs are significantly snowier than St. Anton, with unconfirmed claims of 400-inch annual snowfall at elevations comparable to Galzig. Powder and high/low month statistics were derived by scaling these numbers to those from resorts in the Alps that have monthly information available. Exposures are primarily based upon that of designated runs and nearby ungroomed terrain. 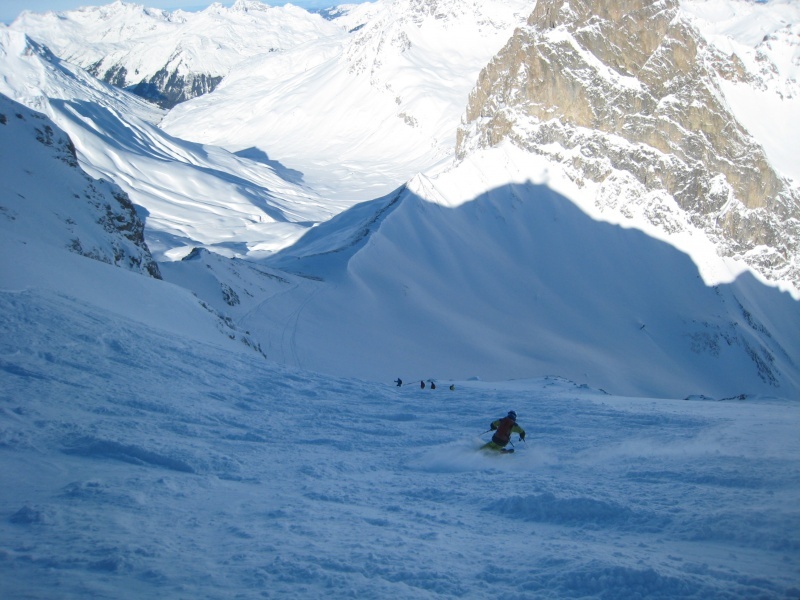 Guided off-piste terrain in the Arlberg region is often far from lifts, may require short hikes to access or a bus ride from the end of a run back to the lifts. 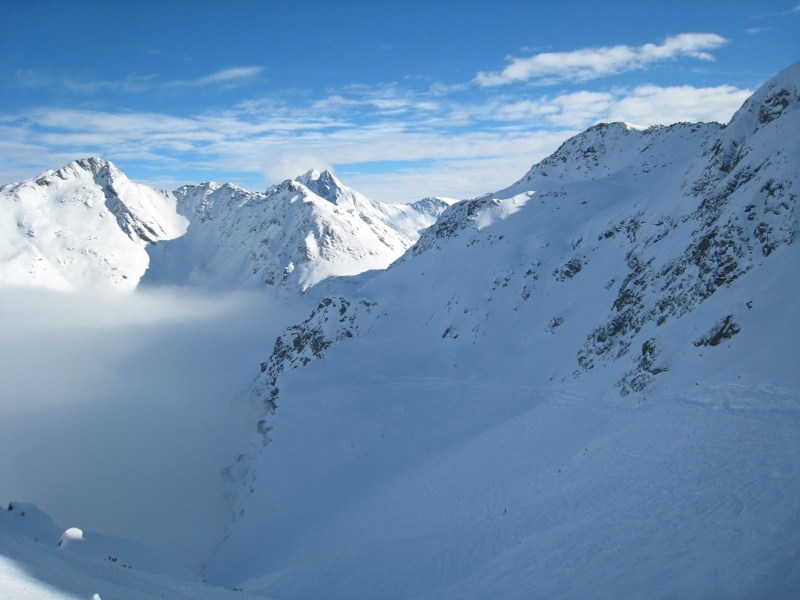 Warth-Schröcken is the snowiest ski resort in the Alps with confirmed data averaging 422 inches per season. It is located north of Lech, and a 2km long gondola to link the resorts was built in summer 2013 after our visit. The road between Lech and Warth is closed in winter. Relatively low elevations and predominantly sunny exposures are the downsides to snow conditions in the Arlberg. St. Anton is in many ways the Jackson Hole of the Alps; great terrain, high snowfall for its region but minimal north exposure. This is another reason to pay for an off-piste guide. 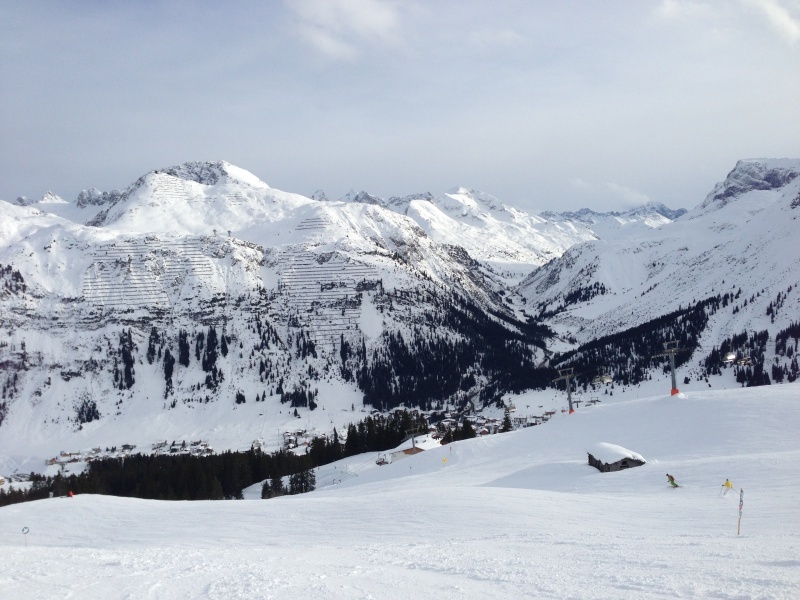 Rendl’s pistes face southwest, but the off-piste back to town faces northwest. Kapall’s pistes face south but the off-piste we skied to Nasserein faces northeast. And the signature terrain of the vast Valluga bowls faces mostly south while the guide-mandatory off-piste off the backside to Zürs faces north or northwest. The road through Lech-Zürs runs on a north-south axis. Consequently, most ski terrain in these resorts faces east or west from the surrounding ridges back to the road. Snow preservation in in Lech-Zürs is thus usually better than at St. Anton, but our visit began with a warm weekend that formed a crust on most ungroomed slopes that did not face north. Stuben and Warth-Schröcken face predominantly north but both are much smaller in scale than St. Anton and Lech-Zürs. 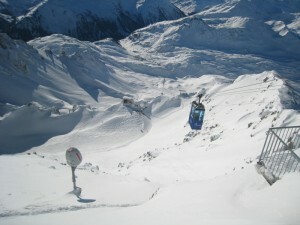 Crowds and prices are higher in the Alps during the school holiday season, which runs from mid-February to early March. This coincides with the most snow-sure period at most resorts. With high snowfall and a less than ideal snow preservation profile, the resorts of the Arlberg are more attractive before this high price school holiday period, and less attractive afterward. We encountered some transitional snow on sunny days, so outside of storm days I would expect widespread spring conditions in March and April. In European ski complexes like the Arlberg, a day-by-day description of one’s personal experience as I’ve done below is often most illuminating. But first are our overall impressions, recognizing that in an area this vast you won’t see everything in a week. Cruising: Richard found the groomed skiing at Lech-Zürs to be the most enjoyable of his Alpine experiences up to that point, which had included St. Moritz, Kitzbuhel and Flaine. St. Anton’s groomers were best up high on Kapall or Rendl, or over toward St. Christophe and Rauz, though most of these are sun exposed. The groomed skiing at Stuben was good when we had visibility. In the Alps 90 percent or more of skiers stick to the groomed runs, so slope congestion, moguls and hard packed snow can be issues. This was very evident on most lower pistes in St. Anton, both due to the proximity of ample lodging at the base, as well as lower altitude and southeast exposure. Moguls: The upper bowls of the Valluga will become vast mogul fields after a few sunny days. With the sunny exposure they should be timed for appropriate softening. There are north-facing bumps off trail near the Zammermoos chair. Steeps: There are numerous steep lines between the Valluga bowls that can be scouted from the Schindlergrat chair. Other steep sectors are less obvious and should probably be explored first with guides or other people with extensive local experience. Wide Open Spaces: The tree line here is located at about 5,500 feet, so the vast majority of skiing, especially in better snow, is above it. Trees: Skiing in the trees is limited, and even marked as forbidden in some sectors. I observed extensive treed areas on the lower sectors of Rendl and Stuben but never skied in them due to difficult snow conditions. A bad weather day in the Alps is usually a limited ski day. Lower altitude skiing is usually on groomed runs or skier packed moguls. Powder: The Arlberg is one of the most attractive areas in the Alps for powderhounds due to the high snowfall incidence and nicely pitched fall lines. The front side of the Valluga at St. Anton is vast but also competitive due to reputation, and will often get skied out in a day or two. Lech-Zürs has much less competition, but still has long fall lines between many of its groomed pistes. My powder skiing was done with the guides based in St. Anton, but I know from other skiers that if you’re on your own the powder will be much easier to come by at Lech-Zürs, and probably at Stuben and Warth-Schröcken as well. Hiking and Backcountry: There is some debate about how often it’s necessary to hire guides maximize ski quality in the Alps. In some places it’s mandatory for navigating glacial hazards, which are minimal at the Arlberg’s relatively low elevation. However, every advanced and expert skier should hire a guide for at least one day to ski the spectacular backside Valluga run to Zürs. The other runs I skied with guides ranged far off the beaten path and I would never have found them on my own, although I could now find them as a repeat visitor. Skiing these areas still requires a partner, rescue gear, snow safety knowledge and favorable snow stability in the uncontrolled terrain. While I found Piste-to-Powder to be excellent guides, they are based in St. Anton. For those who want to concentrate on Lech-Zürs off-piste, advanced classes in the Lech ski school can do that. Crowds: St. Anton and Lech-Zürs have state-of the-art lift systems, highlighted by the “ferris wheel” Galzigbahn gondola from St. Anton’s base. The only lift line of any length that I encountered all week was for the Valluga 1 tram on a fresh snow day, and the Schindlergrat chair accesses most of the same terrain. Stuben was very quiet each day I was there, but it is served by just three slow chairlifts. Keep in mind that my impressions are based on the January low season and it is surely busier during Christmas or the February/early March school holidays. Intermediates: Lech-Zürs is an excellent intermediate destination. 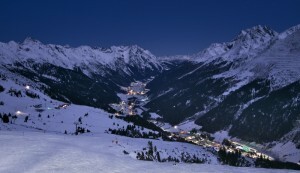 At St. Anton intermediates will have to contend with congestion on the lower slopes and more variable snow conditions. St. Anton’s terrain is much more attractive to off-piste skiers than to those who prefer groomed runs. 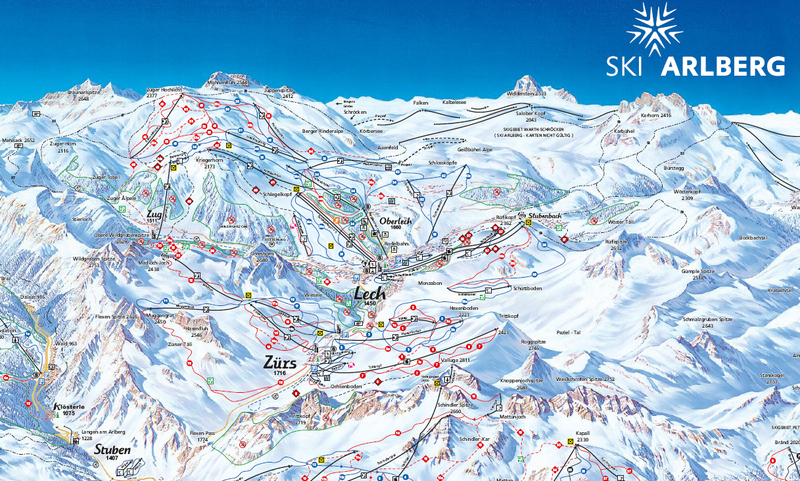 Novices/Children: On the trail maps, blue is designated “easy,” but true novice terrain is minimal at St. Anton and only slightly more abundant around the Oberlech area at Lech-Zürs. The compact area and all-inclusive meal plans at the hotels make Lech-Zürs a family-friendly destination, assuming that the high expense of an upscale resort is not a deterrent. 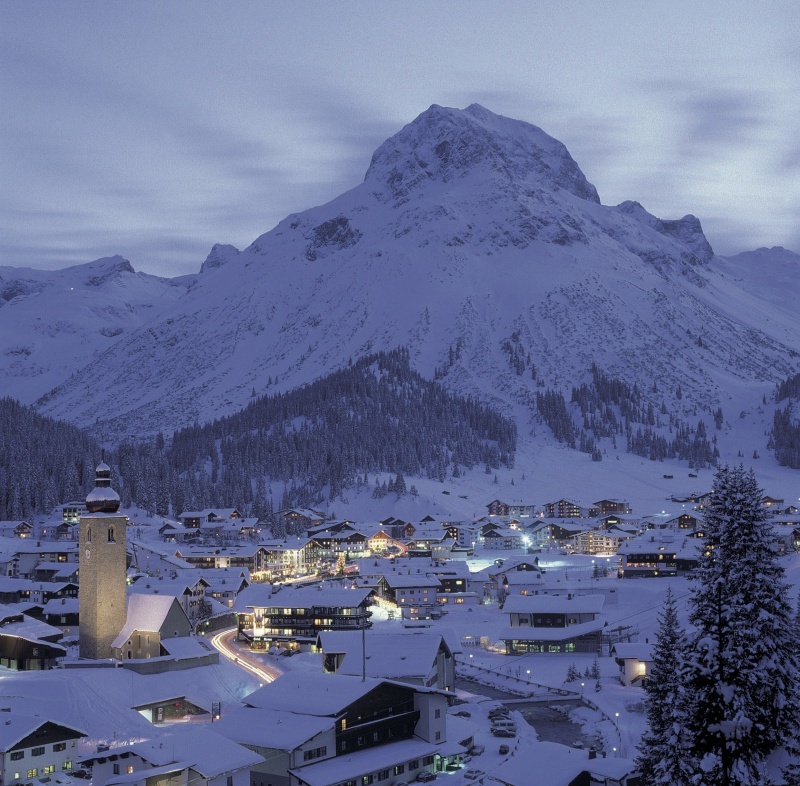 The Resorts and Towns: St. Anton is renowned for its lively après-ski and nightlife. Bars like the Underground are hopping for a couple of hours after skiing. With many visitors using their hotel meal plan, après-ski is followed by a lull before dance clubs and other night spots get going after 10 p.m.
We saw very little of this due, however, thanks to exhausting ski days and our hotel location in Lech. After skiing I welcomed the Sandhof’s downstairs “biospa,” featuring steam room, sauna, multispray showers and warm waterbeds. The Sandhof’s dinners were of sufficient quality that we were not motivated to eat any dinners outside of the hotel. We rented a car as we were spending another week skiing at three areas in eastern Switzerland. There is, however, direct train service from Zurich to St. Anton, which most destination week visitors use. Hotels and restaurants in the Arlberg are relatively expensive by American standards, though as in most of Europe lift tickets are cheaper. Costs are more defined when you select a hotel with a half-board plan that includes breakfasts and dinners. 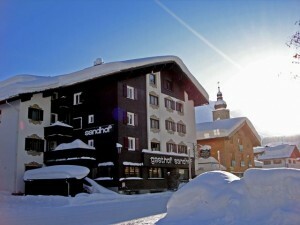 Most hotels in Austrian ski resorts are relatively small in scale and family owned, usually with personalized service. The Sandhof’s “winter sports weeks” in January 2015 are offered for about $1,700 per person including lodging, meals and lift tickets. 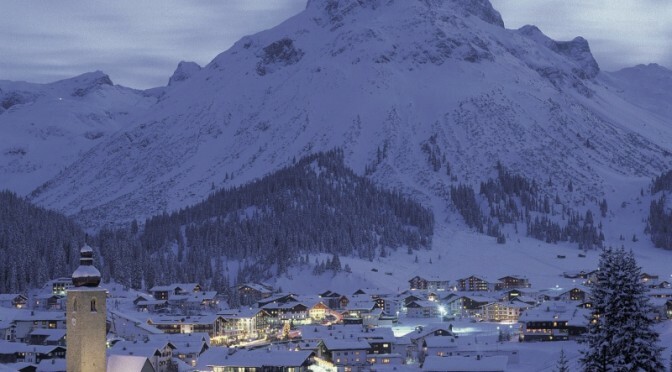 Most hotels in Lech-Zürs will be more expensive than that, though many in St. Anton can be cheaper. Prices in both resorts will be higher during the mid-February to early March holidays. For most skiers, the choice to lodge in St. Anton or Lech-Zürs will come down to preference for resort ambience or price. The free bus that runs between Lech-Zürs and Rauz every 10 minutes makes it easy to ski either lift complex no matter where you are based. An exception would be if you are using guides based in St. Anton who want you to be there before the lifts open. 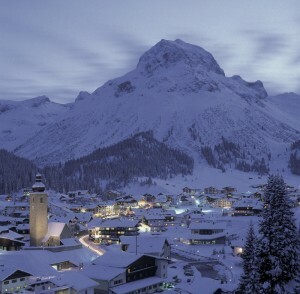 Conversely, if you want to ski Warth-Schröcken it would be more desirable to be based in Lech-Zürs. The Arlberg is one of the world’s premier ski destinations, with varied ski terrain and resort ambience to serve nearly all skiers’ tastes. Richard and I were joined for our first day in the Arlberg by his friend Chris, who was weekending with friends in St. Anton, and together we quickly ascended two high-speed quads to the Kreigerhorn above Lech. Taking in our surroundings we opted to try the Steinmahder, the highest and most distant lift to the northwest of Lech. A thin overcast yielded flat light for the first couple of runs, although the southern exposure of the Steinmahder aided in visibility. Despite the warmup the last snowfall from the previous week exhibited few effects of a melt/freeze cycle, especially at higher elevation. There appeared to be some interesting off-piste between the Hasensprung and Rotschrofen lifts, but ski patrol waved me off from there. I tested a short section to skier’s right of Rotschrofen and encountered some breakable crust. I noticed that I needed to traverse around to a piste leading to Wiebermahd, the northernmost of Lech’s marked runs from which some of Warth-Schröcken’s lifts are visible not far in the distance. There are depressions/terrain traps in between, so while this is not a tempting area for off-piste skiing, the new gondola linking the resorts now traverses this area. We enjoyed a sunny break from about 10:30 to 12:30, which covered the entire time we were skiing the east side of the valley between Lech and Zürs. After a couple of nice cruisers in the Hexenboden area, Chris caught his bus and Richard and I took one run up the Trittkopf tram. I took an off-piste foray here, got cliffed out and had to backtrack a bit, but found a short section of supportable soft windbuff down to one of the pistes. Across the piste, however, was more of the breakable crust, so once back on the groomed I remained there to the base of Trittkopf, where Richard was waiting for a nice Italian lunch of Neapolitan style pizza and spaghetti. With the nice weather we ate outside, but clouds returned along with a bit of breeze from Flexen Pass to the south by the time we paid our tab. We took a small connector over to Hexenboden, where they have thoughtfully built a ski bridge across the road to reach the Zürsersee lift ascending the west side of the valley. It was now close to 2 p.m. and while Richard took the Madloch to complete the circuit back to Lech I opted to explore the Muggengrat area. The off-piste under the lift faces north and is fairly sheltered by high peaks above, but there was nevertheless some breakable crust. The light was getting flat and it would have been easier to find consistent lines with better visibility. I also sampled a long red piste off the back that curls around to a long runout back to the Trittkopf base. There was a short bowl between the upper part of the zigzag piste that had been sufficiently skier packed for more fluid skiing. Having satisfied my need to explore, I then headed up to Madloch and off the back. This White Ring run descends some 3,000 vertical feet back towards Zug, and the lift company has deliberately allowed the Madloch chair to remain a slow fixed-grip double to minimize congestion and wear on that run. Near the bottom there is normally a long runout directly back to Lech but it was closed, so Richard also had to ride the 2,000 vertical lift out of Zug into the terrain above Lech where we had first skied in the morning. I skied this time through Oberlech, a small enclave of hotels and restaurants 700 feet above Lech, just to get a look. Access in winter is only available via gondola. The White Ring circuit can be done easily in about three hours over roughly 10,000 vertical feet of skiing. But it’s more interesting to sample some extra lifts and runs along the way. I ended up logging 25,100 vertical feet that day, mostly on groomed runs. The logistics for most skiers traveling from Lech to St. Anton is easy, as the free bus to Rauz runs every 10 minutes. Not so much for me, as the Piste-to-Powder guides want you at their Cafe Anton meeting place by 8:45 before the lifts open. This requires a different bus that departs Lech only once an hour, meaning 8:06 a.m.for me, and with the Sandhof’s breakfast opening at 8:00 I had to request the night before that at least the fruit, juices, cold cuts and cereals be put out by 7:40 or so. As was the case with our arrival glitch, the Sandhof was very accommodating to my needs. Piste-to-Powder supplies avy gear and backpacks if needed as part of the 110 Euro per day cost. There are four broad level groupings, ranging from slowest to fastest, and I was in a group 3 with guide Alex and four Brits: Al, John, Paul and Martin. The day went smoothly as it was a very compatible group in terms of speed and ski ability. Although not optimal, conditions were much better than I had expected given the breakable crust I found off piste the day before in Lech-Zürs. This is why you’re hiring guides in the first place. They know where the snow is best preserved, and lead those unfamiliar with the terrain to safe routes that a first timer would likely never find. They also knew how to avoid a fog layer that persisted all morning between 1,800 and 2,300 meters. Our morning runs all took place on the Rendl side of St. Anton. First was a descent directly towards town from the Gampberg lift. The top section was accessed through openings in the snow fences, which are ubiquitous in the Arlberg for avalanche safety. The middle section of some 1,000 vertical feet was decent skiing, maybe half of it in leftover powder. The next 1,000 feet or so was down a narrow set of firm bumps through a gap in the forest to a catwalk leading to a piste back to the Rendl tram. We next ascended to the top of Rendl at 2,650 meters, which was above the clouds. Alex led us off the back into an off-piste bowl, which was skier packed but fairly soft with its shaded exposure. Lower down in the fog you were forced to follow the skier in front of you just to see where you were going. Being first was not an advantage here. Some soft snow beneath the clouds led to another bump line to reach the same catwalk as the first run. We went into lunch at Cafe Anton at about 12:30. While we dined, the mid-mountain fog transitioned to a high overcast as we dropped off the back of Kapall. Here an enticing bowl had no tracks, so it came as no surprise that it ends in a cliff. Partway down there’s a short traverse around the trackless bowl with a view across the valley towards Rendl. We descended through a packed powder gap in the cliff band scattered with a smattering of bumps before a smooth runout through the valley to east side of Nasserein. We left Nasserein via a gondola to the Zammermoos chair. By now it was 3:30 and the clouds partially lifted to reveal my first view of the upper mountain Schindler Spitze far above St. Anton. There are amazing lines in that view but they all face due south, so you need to be very lucky to find decent snow in them. Alex took us to an interesting chute between St. Anton and St. Christophe. This was the best snow of the day; settled, but loose powder. Below that was a winding gully with skier packed snow, from which we emerged into a short meadow surprised with a few turns of untracked. After a short walk up a road and skied down to the Underground, Piste-to-Powder’s après-ski spot, missing my bus back to Lech by eight minutes. When conditions are ideal, there’s a a fair amount of grunt work required to get to the best snow on Piste-to-Powder tours. Runs often involve long traverses and bumpy exits over hard snow. Those in Level 3 and 4 groups can expect 15-minute hikes or long diagonal sidesteps in search of the least tracked powder. . Feeling a bit under the weather, I bailed out of the guided skiing I had reserved for Tuesday. For a short day in snowy and foggy weather, Richard and I decided to check out Stuben, a worthy stop for ski history buffs with its statue of Hannes Schneider, who introduced skiing to many North Americans. Two slow double chairs ascend one of the few direct north faces in the Arlberg, totaling about 3,000 vertical feet of which the top two-thirds was enveloped in cloud on our visit. Red trail markers alongside the runs help to offset the vertigo, but on our first run the mid-mountain fog was so thick we never saw the return to the upper lift and wound up back at the base. After a couple of runs on the mountain’s back side, from which the cloud temporarily lifted, we skied the lower half of the front side via a blue piste to Alpe Rauz, where a ski bridge crosses the Alberg Pass road to access a high-speed quad that connects with the St. Anton lift complex. We skied the long #12 and #4 pistes to the Zammermoos chair, our last lift ride with the Piste-to-Powder guides the day before, before returning to Rauz and descending via a winding canyon back to Stuben. On our fourth day Richard dropped me off for another day with Piste-to-Powder before continuing on to St. Anton. John, Martin and I were paired once again with Alex for our guide. Al was sick and Paul had moved to a faster group, so they were replaced by a Swedish couple Ted and Karen. The group remained very compatible in pace and ski ability. Wednesday dawned completely clear. A modest two inches of new snow was reported at the resorts, and perhaps twice that amount accumulated up high. After a warmup run, Piste-to-Powder sent all of their Level 3 and 4 groups up the Valluga trams. The upper tram, which reaches 9,220 feet, is for sightseers only unless you’re with a guide. The cabins are tiny; our group of six would not fit with skis. The lift is also used to mitigate avalanche risks to the pistes below. We were there, however, for the famous descent of Valluga’s backside to Zürs. This begins with a switchback sideslip descent of the top section as there are more hidden rocks than are readily apparent from a casual look. Beyond this is a saddle to skiers’ left which you must cross to descend the northwest drainage to Zürs. The vast skier’s right drainage is a terrain trap that would require a very long hike to return to civilization. This is an alternative descent due north, also leading to Zürs, but a stiff north wind had scoured it clean of fresh powder. We skied a short section below the switchbacks, then traversed left into the saddle beyond which lies a vast, shaded bowl that was largely filled with untracked powder. 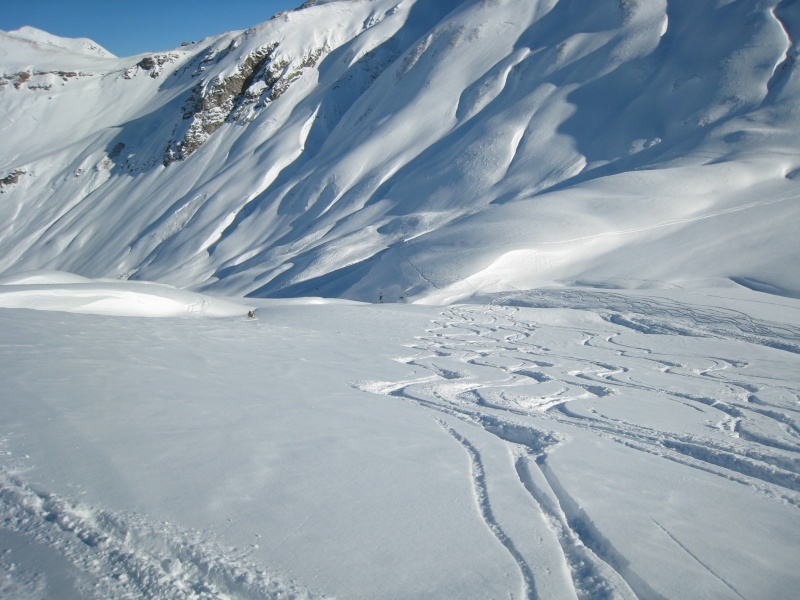 The Piste-to-Powder guides would occasionally lead traverses to bypass wind-affected slopes to reach others with better snow. One of these led to another wide open powder bowl before a long runout to Zürs’ Trittalp chair. We took a lap there, traversing out to a powder run through scattered trees. We ate lunch in Zürs around 12:30, then took the free bus to Rauz and skied down to Stuben. We rode up the two front chairs, then set off on a 15 to 20-minute traverse with several diagonal sidesteps before we were finally rewarded by the most consistent powder of the week for about 1,000 vertical feet. This was followed by a short descent in direct sun through thick powder, some packed powder bumps shaded by opposing mountains, and finally a long exit trail to a bus stop on a line from Verwall to service backcountry and cross-country skiers. We caught the last bus of the day. Our quantity of skiing was modest due to waits for the tram, two bus rides, the slow chairs at Stuben and the slog out to our final run. This was, however, the highlight of the week, with fresh snow and amazing scenery in a pristine wilderness setting. I had to once again catch the 8:06 bus from Lech for my last day with Piste-to-Powder. Of our original group, only Martin remained, and we were paired with a different guide, Thomas. Our new ski group of six included some Finns and an Australian who now works for Google in San Francisco. This group’s pace was a touch faster, and our “warmup” run was an ungroomed line from Galzig to Zammermoos. We took two runs on the Schindlergrat lift, first exiting to the right and climbing a short uphill traverse to the Mattun bowl across from Kapall. Like all of the upper bowls Mattun faces south, so Thomas linked traverses out to slight wraparounds that tilted a bit east and had lighter powder. The direct south lines already suffered some crust from Wednesday’s sun. On our second lap on Schindlergrat we embarked upon a very long traverse to skier’s right for a shorter section of partially east-facing powder. We were now positioned to ski down to Rauz and under the road to Stuben for lunch, where we added a Scot moving up from a slower group. Thomas then led us from Stuben on the identical run we did with Alex the day before. Snow was not as good the second time, but it was still the best of the day. Low on that run we could see up the drainage to many other off-piste lines likely accessed via a traverse from Stuben visible from that resort’s back side lift. Thomas, however, cautioned that the hike to reach those lines was more tedious than the one we did. We caught the bus back to St. Anton at about 2:20 with enough time for another run up Rendl. We took the far looker’s right Riffel 1 chair, then traversed and sidestepped for about 15 minutes to reach the Rossfall area. By this time our legs were burning, and the exhaustion prompted several crashes in the more variable powder before a 10-minute hike and ski from the bottom back to Rendl. From there we skied on the piste back to St Anton. For our last day in the Arlberg I returned to St. Anton to ski on piste, similar to Richard’s day two days earlier. Thursday exhausted me, and I got a late alpine start. It was sunny more often than not but some clouds remained high on the mountain. I used the free bus to Rauz to start and skied down to Zammermoos, keeping an eye on the upper mountain. I took a run down to St. Christophe and when I got back to Galzig the upper mountain had cleared a bit, so I boarded the Valluga 1 tram. There is a short piste from the tram down to a T-bar that ascends to a saddle not far below the top of Schindlergrat. From there, the long piste #16 descends the bowl under the Valluga. I went back up on Schindlergrat, from where you can take the same piste under the Valluga or #15 into the Schindler Kar bowl before exiting right onto a cat track halfway down. Instead, I continued down the bowl on ungroomed and mogulled “skiroute #15a”, stopping partway for overview pictures of St. Anton. The rest of the afternoon was spent on lower pistes. I skied down to the base, then took runs to Nasserein and two from Kapall. I skied back to Rauz in time to catch the free bus back to Lech.